After "Z Storm", "S Storm" and "L Storm", comes "P Storm". 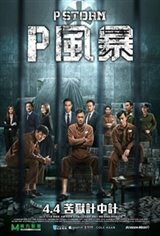 Louis Koo returns as William Luk, this time going undercover as a prisoner to investigate correctional officers who are receiving bribes. In prison, he meets Yuan and finds out that the prisoner has conspired with the governor. Meanwhile, Ming, an officer from ICAC, is working with Liang, an officer from the Bureau of Anti-corruption, to go after Yun, a corrupt Mainland officer also known as White Glove. William then decides to work with Ming to target a group of criminals across Hong Kong and Mainland China.